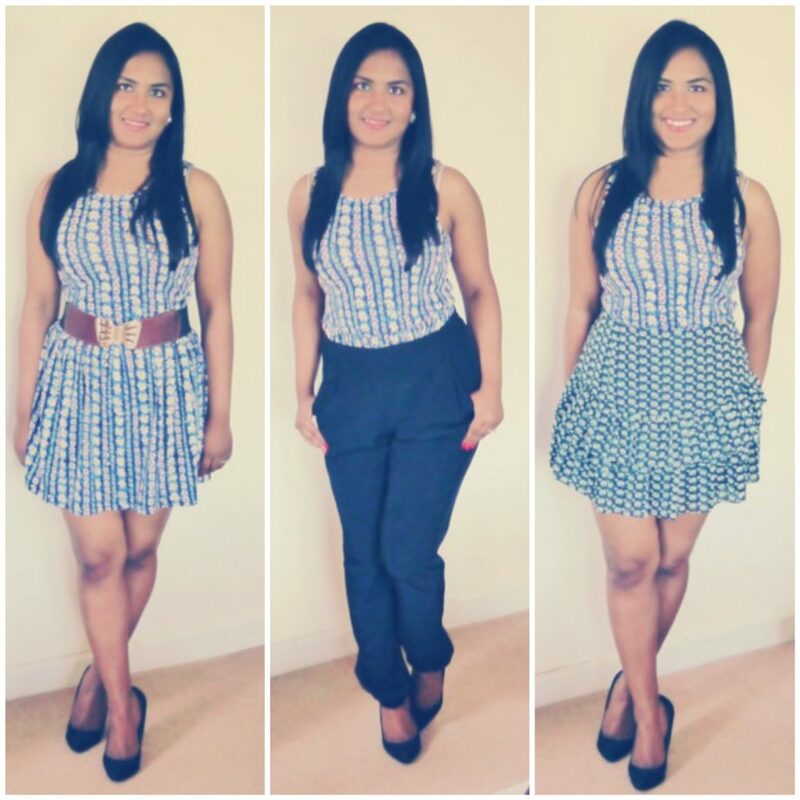 Petite Edition: How To Wear 1 Dress In 3 Different Ways ? Hello Everyone! Hope you are having a great day. Today’s blog post is about a little petite fashion experiment I did over the weekend. I have a lovely floral dress from Topshop which I wanted to mix and match with different pieces. The floral dress is not from petite section and is size 8, however it fits me perfectly. Outfit 1– I have paired Topshop UK size 8 floral dress with medium size Twist Lock Elastic Waist Belt from Oasis. This belt is a blessing in disguise if you have a tummy. It camouflaged the belly and gave the outfit a great look. The shoes are my staple Barratt pointed black suede heels in size 3. Outfit 2– I paired the dress with Topshop Petite Satin Joggers. When I thought of this idea, I was absolutely sure I would look bonkers but it turned to look really great. Of course there was bit of dress material which you will need to adjust accordingly so that you don’t look like you have something stacked underneath. I was very happy with the look and this gave me an idea what kind of top would look great with the joggers as I was struggling to find one which looks good with it. While writing this blog, I have been on a personal fashion journey and constantly discovering what works on my petite frame . So if you are a petite girl and have any suggestion or feedback do write to me. Outfit 3- I bought this Matalan skirt for an upcoming holiday. I was quite excited to wear it but once I was back from the holiday I never ended up wearing it anywhere. I thought I will try this skirt with the dress and see how it looks. To my surprise it kind of looked quite cute and I was very happy and can’t wait to wear to a brunch with the girls.